I love the modern, simple look of this one. It uses tons of white, with little strips of colored fabrics. 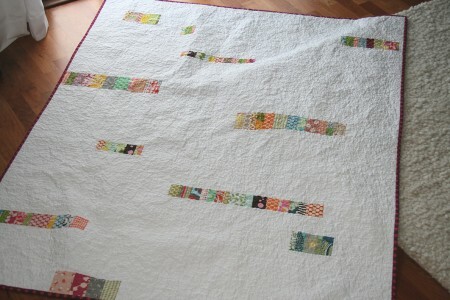 I used up more scraps to make this one, so the size of the strips varied based on what size scraps I had available. I wanted randomly placed strips of color, and I think it turned out just as I had imagined it. 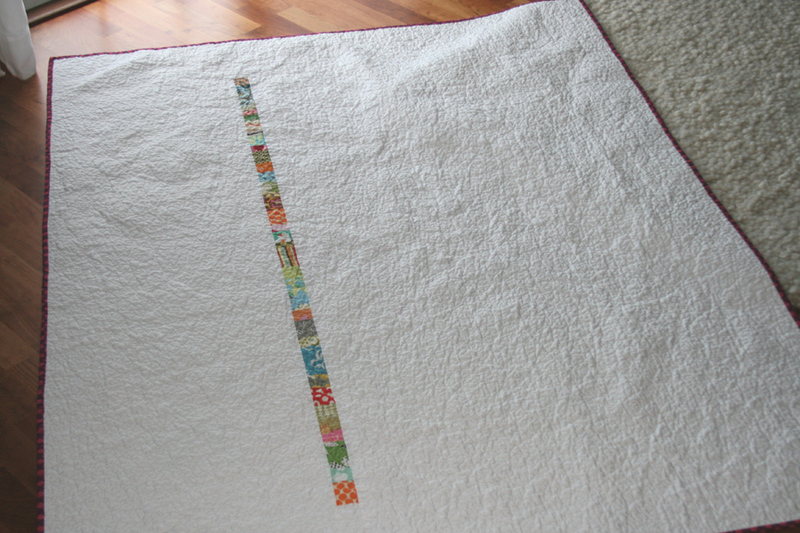 For the back, I pieced together one long strip of scraps, and placed it vertically off-center. It’s bound with polka dotted fabric (of course!). I like this darker purple Anna Maria Horner fabric with raspberry colored dots.I love a dark binding, especially on a quilt with a lot of white. This quilt is the largest I’ve made (the largest I’ve actually finished, that is! ), measuring about 55″ x 70″. If you haven’t already, be sure to enter my 100 post giveaway. I’ll be selecting a winner on Sunday. I love all your crafty gift ideas — and of course if you need some ideas, be sure to take a glance at the comments. How can you not be inspired by all that craftiness! This entry was posted in [search] Strip Quilts, 2008 Finished Quilts, Finished Quilts, Household Sewing - bags, napkins, pillows, Posts about Quilts, Quilts and tagged Amy Butler, anna maria horner, denyse schmidt, Fabric, fabric scraps, flea market fancy, free motion, handmade, quilt, quilting. Bookmark the permalink. 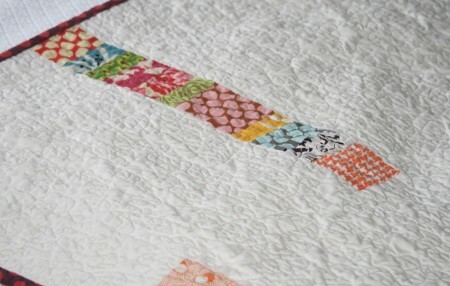 I really like all of these projects you’ve done with the white and little bits of scraps. The scraps look so great with the white. So simple yet not boring. That is really beautiful. I saw it on flickr and came over to see more. Congrats on finishing it! Looks lovely in these pictures! I really love this quilt. I need to dig into my scraps and make one. So so simple and beautiful! Love it!! This quilt is beautiful. The perfect balance of color. I would love to make one like it. I love your quilt and I’m happy to report that you won my giveaway! I just stumbled across your blog yesterday and I LOVE your work. You have a great sense of color and I adore this latest quilt. I will have to try a quilt with lots-o’white!! great job! I love your work. That quilt is stunning! i love how this came together. simple, but so great! I just love this! I’m so glad I came across your blog – another to add to my ever increasing list! I love the designs of your quilts. They are so graphic and fun. Definitely not “Grandma’s Quilts”. 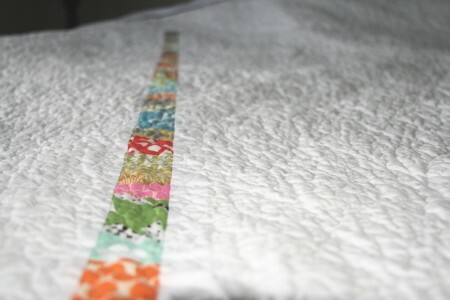 You’re inspiring me to give quilting a try myself. If only I can get over my fear of breaking needles and wads of thread that get hung up on everything I try to make. How do I stop that from happening anyway?? It looks so snuggly and warm. Great job. oh, wow–I LOVE this. What a great concept. Love this quilt! Can you give a quick overview as to how you pieced it? thanks a bunch!